My name does not count. I am Maria, Francesca or Paola, it makes no difference. What matters is that I am a woman, a woman that in the last fifteen years has married to Silvio Berlusconi’s cause, a woman that gave him her vote and her trust, exactly what was stolen to Veronica Lario. 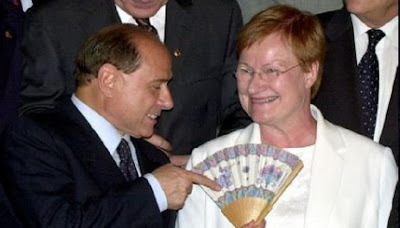 Maybe Berlusconi's wife will ask a legal divorce, bringing the discussion behind a court, claiming a charge to her husband for the seriousness of his behaviour outside marriage. Well, if this will happen, I demand that justice be done, because I have to receive the same treatment. I was also offended as a wife, as mother and as a woman, every time that in these shameful years the Italian Prime Minister appeared on the screens and in newspapers around the world spreading a humiliating and degrading picture of myself. The vote is an important obligation as marriage is. They both require responsibility and decorum. They both deserve loyalty and respecting word. Mrs. Lario is rightly concerned about the future of her sons. In her case, we are talking about a lot of money, companies and investments. I do not ask so much, but I am also a mother and I have my children in the middle of my thoughts too. A faithless husband must pay for his sins to those he made his promises, as the leader of a country must be accountable to every woman whose name is tarnished because of his actions or even his childish jokes. It is essential that justice be done. This is an indispensable warning, especially in a country like ours. It is very important to remind at our today leaders and those who will come that every small gesture they will make, even the most insignificant word spoken, publicly or privately, in any way impinge on all of us. In this way they would think twice before running for elections. Italian prime minister Silvio Berlusconi's wife Veronica Lario has requested a formal separation with all legal expenses to be paid by Berlusconi, Italian daily Corriere della Sera reported on Thursday. "The request for her legal expenses to be paid is a clear attempt to draw the judge's attention to the spouse's grave behaviour within the family," Corriere quoted family lawyer Anna Galizia Danovi, as saying.